After rebounding nicely from the disappointing Lourdes loss, the University of Michigan-Dearborn men’s basketball team lost a pair of Wolverine-Hoosier Athletic Conference games last week. On Wednesday, the Wolverines traveled to the University of Northwestern Ohio to take on a Racers team that was parallel to the Wolverines in the rankings. Both teams fell just shy of the top-25 but received some votes. It was the first time in program history that UM-Dearborn had ever received votes for the top-25 ranking and were looking to beat Northwestern Ohio to help catapult them into the actual rankings. But the Racers had other ideas and defeated the Wolverines 63-58 on their home floor. Being down three with just over two minutes left in the first half, freshman guard Cody Kegley knocked down a triple to tie the game. But the Racers (8-2, 6-0 WHAC) would hit a three pointer of their own on the next possession to break the tie. After a back and forth second half, the Racers would hit a lay-up with just under a minute left to take the lead and never give it back. Wolverines head coach Taylor Langley said toughness was a key reason for the loss. “We got out-toughed, we got out-rebounded by 12, had some silly turnovers, didn’t execute plays down the stretch,” Langley said. Senior Jeff Cain led the Wolverines with 17 points and three steals. Junior Jason Penn had 12 points and four rebounds. As a team, the Wolverines shot 39.3 percent from the floor and like Langley said were out-rebounded 35-23 by the Racers. 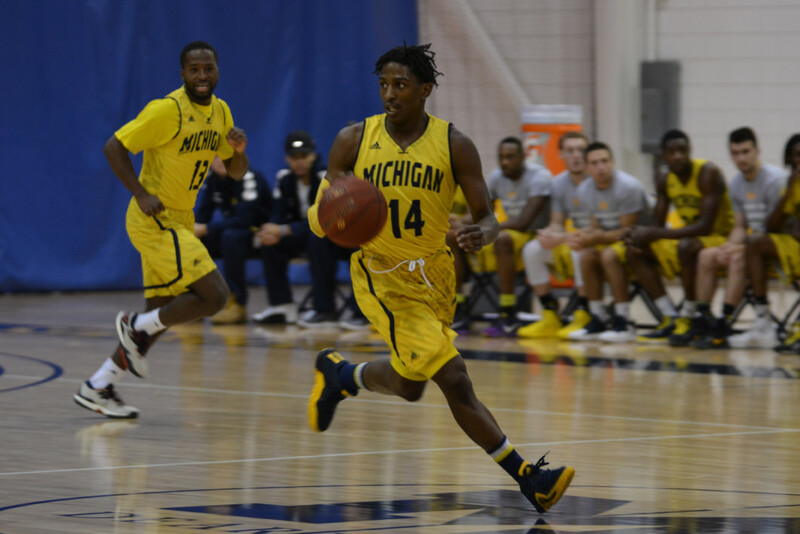 On Saturday, the Wolverines traveled to the Crisler Center to take on Siena Heights. Playing on a big stage appeared to get to UM-Dearborn early on and they could never recover as they fell to the Saints 65-58. The Wolverines (7-5, 2-3) came out sluggish and sloppy as the Saints (5-4, 2-3) got out to a 10-0 lead and then doubled that to a 20-5 lead. Just eight minutes into the game, UM-Dearborn had already committed nine turnovers. The Saints would end the half with a 15 point lead. Cain said a lack of focus was the cause for the rough start. “I think we just weren’t focused. We knew what we were coming into, we knew they were gonna play hard, we knew what we needed to do but I think they just came out and punched us in the mouth and we just took the punch and never punched back until the second half,” Cain said. The second half didn’t start out much better for the Wolverines as Siena Heights grew their lead to 19 in the first four minutes, the largest margin of the game. But then UM-Dearborn would go on a 16-0 run over the next seven minutes to put themselves down three. Senior Marcus Williams scored nine of the Wolverines’ 16 points during the run. UM-Dearborn scratched and clawed their way to remaining just short of the Saints, but back-to-back three’s by Siena Heights with six minutes to play derailed any Wolverines momentum. The Wolverines would get the game to within one possession with just under three minutes to play but the Saints finished them off after that. Langley said he liked his team’s effort in the second half, but playing well for just one half won’t get the job done. “We just played the way we’re capable of playing in the second half our guys competed and they fought very hard and I was happy to see that. Unfortunately you have to play two halves of basketball to win games,” Langley said. Penn had another terrific game scoring 17 points and hitting seven of his nine shots. The Wolverines raised their shooting percentage by nearly 17 points in the second half to finish the game shooting 44.2 percent from the field. UM-Dearborn finished the game with 20 turnovers. The Wolverines are now 2-3 in conference play with a couple big wins (Indiana Tech, Davenport) and a couple ugly losses (Lourdes, Siena Heights). Sophomore Xavier Crofford said his team needs to stay consistent in order to turn the ship around. “Play the same way everyday, the way we come out and play hard against the better teams in our league is the same way we have to play when we come out and play against everybody else so just staying consistent,” Crofford said. The Wolverines will play back-to-back road games this week as they travel to Lawrence Tech on Wednesday and then head to Concordia on Saturday. UM-Dearborn has struggled on the road this season achieving just a 3-4 record away from home court.